Sabbatai Zevi (Hebrew: שַׁבְּתַי צְבִי, other spellings include Shabbetai Ẓevi, Shabbeṯāy Ṣeḇī, Shabsai Tzvi, and Sabetay Sevi in Turkish) (August 1, 1626 – c. September 17, 1676) was a Sephardic ordained rabbi, though of Romaniote origin and a kabbalist, active throughout the Ottoman Empire, who claimed to be the long-awaited Jewish Messiah. He was the founder of the Sabbatean movement. In February 1666, upon arriving in Constantinople, Sabbatai was imprisoned on the order of the grand vizier Ahmed Köprülü; in September of that same year, after being moved from different prisons around the capital to Adrianople (the imperial court's seat) for judgement on accusations of fomenting sedition, Sabbatai was given by Köprülü, in the name of the Sultan Mehmed IV, the choice of either facing death by some type of ordeal, or of converting to Islam. Sabbatai seems to have chosen the latter by donning from then on a Turkish turban. He was then also rewarded by the heads of the Ottoman state with a generous pension for his compliance with their political and religious plans. Some of his followers also converted to Islam—about 300 families who were known as the Dönmeh (converts). He was later banished twice by the Ottoman authorities who were tired of his schemes and discovered him singing psalms with the Jews. He later died in isolation. Sabbatai Zevi was born in Smyrna, Ottoman Empire (İzmir in present-day Turkey), supposedly on Tisha B'Av (the 9th of Av), 1626, the holy day of mourning. His name literally meant the planet Saturn, and in Jewish tradition "The reign of Sabbatai" (The highest planet) was often linked to the advent of the Messiah. Zevi's family were Romaniotes from Patras in present-day Greece; his father, Mordecai, was a poultry dealer in the Morea. During the war between Turkey and Venice, Smyrna became the center of Levantine trade. Mordecai became the Smyrna agent of an English trading house and managed to achieve some wealth in this role. In accordance with the prevailing Jewish custom of the time, Sabbatai's father had him study the Talmud. He attended a yeshiva under the rabbi of Smyrna, Joseph Escapa. Studies in halakha (Jewish law) did not appeal to him, but apparently Zevi did attain proficiency in the Talmud. On the other hand, he was fascinated by mysticism and the Kabbalah, as influenced by Isaac Luria. He found the practical kabbalah – with its asceticism, through which its devotees claimed to be able to communicate with God and the angels, to predict the future and to perform all sorts of miracles – especially appealing. During the first half of the 17th century, millenarian ideas of the approach of the Messianic time were popular. They included ideas of the redemption of the Jews and their return to the land of Israel, with independent sovereignty. The apocalyptic year was identified by Christian authors as 1666 and millenarianism was widespread in England. This belief was so prevalent that Manasseh ben Israel, in his letter to Oliver Cromwell and the Rump Parliament, appealed to it as a reason to readmit Jews into England, saying, "[T]he opinions of many Christians and mine do concur herein, that we both believe that the restoring time of our Nation into their native country is very near at hand." 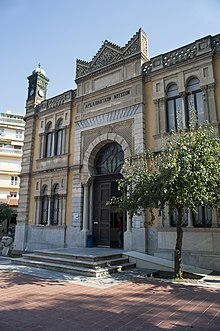 Besides being involved in other commercial activities, Sabbatai's father was the agent for an English trading house in Smyrna and must have had some business contact with English people. Sabbatai could have learned something about these Western millenarian expectations at his father's house. Apart from this general Messianic theory, there was another computation, based on an interpreted passage in the Zohar (a famous Jewish mystical text), and particularly popular among the Jews, according to which the year 1648 was to be the year of Israel's redemption by their long-awaited Jewish Messiah. At age 22 in 1648, Sabbatai started declaring to his followers in Smyrna that he was the true Messianic redeemer. In order to prove this claim he started to pronounce the Tetragrammaton, an act which Judaism emphatically prohibited to all but the Jewish high priest in the Temple in Jerusalem on the Day of Atonement. For scholars acquainted with rabbinical, and kabbalistic literature, the act was highly symbolic. He would also claim that he could fly, but explained to his beholders that he couldn't do so in public because they were 'not worthy enough' to witness the sight. So too, he declared regularly that he was having various visions of God. He revealed his Messiahship early on to Isaac Silveyra and Moses Pinheiro, the latter a brother-in-law of the Italian rabbi and kabbalist Joseph Ergas. However, at this point he was still relatively young to be thought of as an accepted and established rabbinic authority; and his influence in the local community was not widespread. Even though Sabbatai had led the pious life of a mystic in Smyrna for several years, the older and more established rabbinic leadership was still suspicious of his activities. The local college of rabbis, headed by his teacher, Joseph Escapa, kept a watchful eye on him. When his Messianic pretensions became too bold, they put him and his followers under cherem, a type of excommunication in Judaism. "I, Abraham, was confined in a cave for forty years, and I wondered greatly that the time of miracles did not arrive. Then was heard a voice proclaiming, 'A son will be born in the Hebrew year 5386 [the year 1626 CE] to Mordecai Zevi; and he will be called Shabbethai. He will humble the great dragon; ... he, the true Messiah, will sit upon My throne." New Mosque, built by Donmeh community of Salonica during the Ottoman period. With this document, Sabbatai chose Salonica, at that time a center of kabbalists, for his base. He proclaimed himself the Messiah or "anointed one," gaining many adherents. He put on all sorts of mystical events — e.g., the celebration of his marriage as the "One Without End" (the Ein Sof) with the Torah, preparing a solemn festival to which he invited his friends. The rabbis of Salonica, headed by Rabbi Hiyya Abraham Di Boton, banished him from the city. The sources differ widely as to the route he took after this expulsion, with Alexandria, Athens, Constantinople, Jerusalem, and Smyrna mentioned as temporary centers. After wandering, he settled in Cairo, where he resided for about two years (1660–1662). Raphael Joseph Halabi ("of Aleppo") was a wealthy and influential Jew who held the high position of mint-master and tax-farmer in Cairo under the Ottoman government. He led an ascetic life, which included fasting, bathing in cold water, and scourging his body at night. He used his great wealth for charity, supporting poor Talmudists and Kabbalists, fifty of whom reportedly dined at his table regularly. Sabbatai befriended Raphael Joseph, who became a supporter and promoter of his Messianic claims. About 1663 Sabbatai moved on to Jerusalem. Here he resumed his former ascetic practice of frequent fasting and other penances. Many saw this as proof of his extraordinary piety. He was said to have a good voice, and sang psalms all night long, or at times Spanish love-songs, to which he gave mystical interpretations. He attracted crowds of listeners. At other times he prayed and cried at the graves of pious men and women. He distributed sweetmeats to children on the streets. Gradually he gathered a circle of adherents. The important community of Jerusalem at the time was also in need of money to keep up with the heavy taxes imposed on it by the Ottoman government. The community was coming up short of funds to pay these levies, and these arrears could have dire consequences. Sabbatai, known as the favorite of the rich and powerful Raphael Joseph Halabi in the Turkish government center in Cairo, was chosen as the community envoy to appeal to Halabi for money and support. His success in getting the funds to pay off the Turks raised his prestige. His followers dated his public career from this journey to Cairo. Another event helped spread Sabbatai's fame in the Jewish world of the time in the course of his second stay in Cairo. During the Chmielnicki massacres in Poland, a Jewish orphan girl named Sarah, about six years old, was found by Christians and sent to a convent for care. After ten years, she escaped (through a miracle she claimed), and made her way to Amsterdam. Some years later she went to Livorno where, according to reports, she led a life of prostitution. She also conceived the notion that she was to become the bride of the Messiah, who was soon to appear. When the report of Sarah's adventures reached Cairo, Sabbatai claimed that such a consort had been promised to him in a dream because he, as the Messiah, was bound to fall in love with an unchaste woman. He reportedly sent messengers to Livorno to bring Sarah to him, and they were married at Halabi's house. Her beauty and eccentricity reportedly helped him gain new followers. Through her a new romantic and licentious element entered Sabbatai's career. Even the overturning of her past scandalous life was seen by Sabbatai's followers as additional confirmation of his messiahship, following the biblical story of the prophet Hosea, who had also been commanded to take a "wife of whoredom" as the first symbolic act of his calling. With Halabi's financial and political backing, a charming wife, and many additional followers, Sabbatai triumphantly returned to Jerusalem. Passing through the city of Gaza, which at the time had an important Jewish community, he met Nathan Benjamin Levi, known since as Nathan of Gaza (נתן עזתי Nathan 'Azzati). Nathan became very active in Sabbatai's subsequent Messianic career, serving as Sabbatai's right-hand man and declaring himself to be the risen Elijah, who, it was predicted, would proclaim the arrival of the Messiah. In 1665, Nathan announced that the Messianic age would begin the following year with the conquest of the world without bloodshed. The Messiah would lead the Ten Lost Tribes back to the Holy Land, "riding on a lion with a seven-headed dragon in its jaws". The rabbis of Jerusalem viewed Sabbatai's movement with great suspicion, and threatened its followers with excommunication. Acknowledging that Jerusalem would not be the best place to enact his plans, Sabbatai left for his native city, Smyrna. Nathan proclaimed that henceforth Gaza, and not Jerusalem, would be the sacred city. On his way from Jerusalem to Smyrna, Sabbatai was greeted enthusiastically in Aleppo. In Smyrna, which he reached in the autumn of 1665, the greatest homage was paid to him. After some hesitation, he publicly declared himself to be the expected Messiah during the Jewish New Year in 1665; his declaration was made in the synagogue, with the blowing of horns, and shouts of "Long live our King, our Messiah!" His followers began to refer to him with the title AMIRAH, a Hebrew acronym for the phrase "Our Lord and King, his Majesty be exalted" (Adoneinu Malkeinu Yarum Hodo). 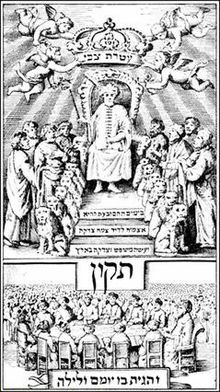 "Sabbatai Zevi enthroned" (image from the Amsterdam/Jewish publication Tikkun, Amsterdam, 1666). Assisted by his wife, Sabbatai became the leader of the community. He used his power to crush the opposition. He deposed the existing rabbi of Smyrna, Aaron Lapapa, and appointed Chaim Benveniste in his place. His popularity grew, as people of all faiths repeated his story. His fame extended far and wide. Italy, Germany, and the Netherlands had centers of his Messianic movement. The Jews of Hamburg and Amsterdam learned of the events in Smyrna from trustworthy Christians. Henry Oldenburg, a distinguished German savant who became the first secretary of the Royal Society, wrote to Baruch Spinoza (Spinozae Epistolae No 33): "All the world here is talking of a rumour of the return of the Israelites ... to their own country. ... Should the news be confirmed, it may bring about a revolution in all things." Sabbatai's followers included many prominent rabbis, such as Isaac Aboab da Fonseca, Moses Raphael de Aguilar, Moses Galante, Moses Zacuto, and the above-mentioned Hayyim Benveniste. Dionysius Musaphia, an adherent of Spinoza, likewise became a follower. People spread fantastic reports, which were widely believed. For example, it was said, "In the north of Scotland a ship had appeared with silken sails and ropes, manned by sailors who spoke Hebrew. The flag bore the inscription 'The Twelve Tribes of Israel'." The Jewish community of Avignon, France prepared to emigrate to the new kingdom in the spring of 1666. 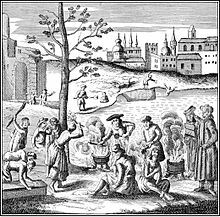 The readiness of the Jews to believe the messianic claims of Sabbatai Zevi may largely be explained by the desperate state of European Jewry in the mid-17th century. The bloody pogroms of Bohdan Khmelnytsky had wiped out around 100,000 Jews in Eastern Europe, or more, others put the numbers killed at between 40,000 and 100,000, about one third of Europe's Jewish population at the time and destroyed many centers of Jewish learning and communal life. There is no doubt that for most of the Jews of Europe there could not have been a more propitious moment for the messiah to deliver salvation than the moment Sabbetai Zevi made his appearance. "The first-begotten Son of God, Shabbethai Tebi, Messiah and Redeemer of the people of Israel, to all the sons of Israel, Peace! Since ye have been deemed worthy to behold the great day and the fulfilment of God's word by the Prophets, your lament and sorrow must be changed into joy, and your fasting into merriment; for ye shall weep no more. Rejoice with song and melody, and change the day formerly spent in sadness and sorrow into a day of jubilee, because I have appeared." Primo's message was considered blasphemous, as Sabbatai wanted to celebrate his birthday rather than the holy day. There was outrage and dissension in the communities; many of the leaders who had regarded the movement sympathetically were shocked at such radical innovations. Solomon Algazi, a prominent Talmudist of Smyrna, and other members of the rabbinate who opposed the abolition of the fast, narrowly escaped death at the hands of Sabbatai's followers. At the beginning of the year 1666, Sabbatai left Izmir for Constantinople (İstanbul in present-day Turkey). He may have been forced to flee by city officials. Nathan Ghazzati had prophesied that, once in Constantinople, Sabbatai would place the sultan's crown on his own head. The grand vizier, Ahmed Köprülü, ordered Sabbatai's immediate arrest upon his arrival and had him imprisoned, maybe to avoid any doubts among local and foreign observers of the imperial court as to the power still wielded by the Turkish Sultanate and by the Sultan himself. Sabbatai's imprisonment discouraged neither him nor his followers at this stage. He was treated well in prison, perhaps because of bribes paid. This seems to have strengthened belief within his immediate circle of followers. Fabulous reports concerning the miraculous deeds "the Messiah" was performing in the Turkish capital were spread by Ghazzati, Abraham Yachini, and Primo among the Jews of Smyrna and in many other communities, and the messianic expectations in the Jewish diasporas continued to rise. After two months' imprisonment in Constantinople, Sabbatai was moved to the state prison at Abydos. Some of his friends were allowed to accompany him. As a result, the Sabbataians called the fortress Migdal Oz (Tower [of] Strength). As Sabbatai had arrived on the day preceding Passover, he slew a paschal lamb for himself and his followers. He ate it with its fat, a violation of Jewish Law. It is said that he pronounced over it the benediction: "Blessed be God who hath restored again that which was forbidden." The immense sums sent to him by his rich followers, the charms of the queenly Sarah, and the cooperation shown by the Turkish officials and others enabled Sabbatai to display royal splendor in the prison castle of Abydos. Accounts of his life there were exaggerated and spread among Jews in Europe, Asia, and Africa. In some parts of Europe, Jews began to unroof their houses and prepare for a new "exodus". In almost every synagogue, Sabbatai's initials were posted, and prayers for him were inserted in the following form: "Bless our Lord and King, the holy and righteous Sabbatai Zevi, the Messiah of the God of Jacob." In Hamburg, the council introduced the custom of praying for Sabbatai not only on Saturday (the Jewish Sabbath), but also on Monday and Thursday. Unbelievers were compelled to remain in the synagogue and join in the prayer with a loud Amen. Sabbatai's picture was printed together with that of King David in most of the prayer-books, along with his kabbalistic formulas and penances. These and similar innovations caused great commotion in some communities. In Moravia excitement reached such a pitch that the government had to intervene, while at Sale, Morocco, the emir ordered a persecution of the Jews. During this period Sabbatai declared the fasts of the Seventeenth of Tammuz and the Ninth of Av (his birthday) would henceforth be feast-days. He contemplated converting the Day of Atonement to one of celebration. Sabbatai Zevi as a prisoner in Abydos. 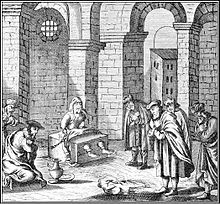 While Sabbatai was in the Abydos prison an incident occurred which ultimately led to Sabbatai's downfall. Two prominent Polish Talmudists from Lwów, Lesser Poland, who were among Sabbatai's visitors in Abydos, informed him that in their native country a prophet, Nehemiah ha-Kohen, had announced the coming of the Messiah. Sabbatai ordered the prophet to appear before him. (See Jew. Encyc. ix. 212a, s.v. Nehemiah ha-Kohen). Nehemiah obeyed, reaching Abydos after a journey of three months at the beginning of September, 1666. The meeting between the two ended in mutual dissatisfaction. Some Sabbataians are said to have contemplated the secret murder of the rival. Nehemiah, however, escaped to Constantinople, where he pretended to embrace Islam to get an audience with the kaymakam. He told him of Sabbatai's ambitions. The kaymakam informed the sultan, Mehmed IV. Sabbatai was taken from Abydos to Adrianople, where the sultan's vizier gave him three choices; subject himself to a trial of his divinity in the form of a volley of arrows (in which should the archers miss, his divinity would be proven); be impaled; or he could convert to Islam. On the following day (September 16, 1666) Zevi came before the sultan, cast off his Jewish garb and put a Turkish turban on his head. Thus his conversion to Islam was accomplished. The sultan was much pleased, and rewarded Sabbatai by conferring on him the title (Mahmed) Effendi, and appointing him as his doorkeeper with a generous salary. Sarah and approximately 300 families among Sabbatai's followers also converted to Islam. These new Muslims thereafter were known as dönmeh (converts). The sultan's officials ordered Sabbatai to take an additional wife to demonstrate his conversion. Some days after his conversion he wrote to Smyrna: "God has made me an Ishmaelite; He commanded, and it was done. The ninth day of my regeneration." Sabbatai's conversion devastated his followers. Muslims and Christians alike ridiculed his followers after the event. In spite of Sabbatai's apostasy, many of his adherents still clung tenaciously to their belief in him, claiming that his conversion was a part of the Messianic scheme. Prophets such as Ghazzati and Primo, who were interested in maintaining the movement, encouraged such belief. In many communities, the Seventeenth of Tammuz and the Ninth of Av were still observed as feast-days in spite of bans and excommunications by the rabbis. At times Sabbatai assumed the role of a pious Muslim and reviled Judaism; at others he associated with Jews as one of their own faith. In March, 1668, he announced that he had been filled with the "Holy Spirit" at Passover, and had received a "revelation." He, or one of his followers, published a mystical work claiming Sabbatai was the true Messiah in spite of his conversion, whose goal was to bring thousands of Muslims to Judaism. He told the sultan, however, that he was trying to convert Jews to Islam. 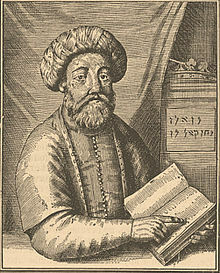 The sultan permitted Sabbatai to associate with other Jews and preach in their synagogues. He succeeded in bringing over a number of Muslims to his kabbalistic views. Whether through his efforts or their willingness to follow in his latest steps, about 300 families of Sephardi Jews converted to Islam, becoming known as the Dönmeh (also spelled Dönme), convert. Some of the followers adhered to a combination of their former Jewish practices as well as Islam. Gradually the Turks tired of Sabbatai's schemes. They ended his doorkeeper's salary and banished him to Constantinople. When he was discovered singing psalms with Jews, the grand vizier ordered his banishment to Dulcigno (today called Ulcinj), a small town in present-day Montenegro. In August 1676, he wrote to the Jewish Community in Berat, Albania, requesting religious books, but he died shortly after in isolation, according to some accounts on September 17, 1676, the High Holy Day of Yom Kippur. His tomb was believed for a long time to have been in Berat, at a tekke built in the yard of the Imperial Mosque (Albanian: Xhamia e Mbretit), where a tomb stood until 1967. Recently, scholars support the theory that he was buried in Dulcigno. His biographer Gershom Scholem mentions that his tomb was visited by Dönme pilgrims from Salonika until the early 20th century. "By the 1680s, the Dönme had congregated in Salonica, the cosmopolitan and majority-Jewish city in Ottoman Greece. For the next 250 years, they would lead an independent communal life — intermarrying, doing business together, maintaining their own shrines, and handing down their secret traditions." By the 19th century, the Dönmeh had become prominent in the tobacco and textile trades. They established progressive schools and some members became politically active. Some joined the Committee of Union and Progress (CUP), the revolutionary party known as the Young Turks. With independence, in the 1910s, Greece expelled the Muslims from its territory, including the Dönmeh. Most migrated to Turkey, where by mid-century they were becoming highly assimilated. At the beginning of 1673, the sultan had Zevi exiled to Ulcinj (Dulcigno, Turkish: Ulkum). His wife died there in 1674, after which Zevi married Esther, the daughter of rabbi Joseph Filosoff of Thessaloniki. He died on 17 September 1676. Upon his death, his widow, brother and children by his first wife moved to Thessaloniki. Although rather little is known about them, various groups called Dönmeh (Turkish for "convert") continue to follow Sabbatai Zevi today, mostly in Turkey. Estimates of the numbers vary. Many sources claim that there are fewer than 100,000 and some of them claim there are several hundred thousand in Turkey. They have been described as presenting themselves as Muslim in public whilst practising their own forms of messianic/mystical Jewish beliefs in private. The Dönme eventually split into three sects, each with quite different beliefs, as Ottoman Jewish scholars Abraham Danon, and Joseph Néhama had pointed out in French-language Jewish studies journal articles over 100 years ago. In the 1930s a new comprehensive study on the history of the sects was also published in French by Abraham Galanté. More recently, Professor Cengiz Şişman, has published a new study called The Burden of Silence. According to a review of his views published in the Israeli newspaper Jerusalem Post, the branch known as Karakaş follow Sufi-influenced practices, while the Kapancıs have not been influenced by Islam at all, and are now completely secular. ^ Scholem, Sabbatai Sevi: The Mystical Messiah: 1626–1676, pp. 103–106 has a whole discussion of the historical probabilities that he was really born on the 9th of Av, which according to Jewish tradition is the date of the destruction of both Temples and is also the date 'prescribed' in some traditions for the birth of the Messiah. ^ Scholem, op. cit., p. 111, mentions, among other evidence of Sabbatai's early rabbinic training and smicha by Rabbi Joseph Eskapha of his native town of Smyrna: "According to the testimony of Leib b. Ozer, the notary of the notary of the Ashkenazi community of Amesterdam ..., Sabbatai was eighteen years old when he was ordained a hakham." Scholem also writes, in the previous sentence: "Thomas Coenen, the Protestant minister serving the Dutch congregation in Smyrna, tells us ... that he received the title hakham, the Sephardi honorific for a rabbi, when still an adolescent." This article incorporates text from a publication now in the public domain: Kaufmann Kohler & Henry Malter (1901–1906). "SHABBETHAI ẒEBI B. MORDECAI". In Singer, Isidore; et al. (eds.). The Jewish Encyclopedia. New York: Funk & Wagnalls. ^ a b c Elsie, Robert (2010). Historical Dictionary of Albania. Rowman & Littlefield. p. 411. ISBN 978-0-8108-6188-6. ^ The mixed multitude:Jacob Frank and the Frankist movement, Pawel Maciejko, University of Pennsylvania Press, Mar 8, 2011, Page 45. ^ This theory was originally suggested by Graetz; Gershom Scholem argued forcefully against it in his major work on Sabbatai quoted throughout this entry. ^ Abramson, Dr. Henry. "Who was Shabbetai Tsvi?". www.henryabramson.com/2012/02/02/shabbetai-tsvi-false-messiah/. ^ Lukach, Harry Charles (1914). The City of Dancing Dervishes and Other Sketches and Studies from the Near East. London: Macmillan and Company. pp. 189–190. ^ Hitchens, Christopher (2011). God is Not Great: How Religion Poisons Everything. London: Atlantic Books. p. 123. ISBN 978-0-85789-715-2. ^ a b c d Halperin 2007, p. 13. ^ Hitchens, Christopher (2011). God is Not Great: How Religion Poisons Everything. London: Atlantic Books. p. 124. ISBN 978-0-85789-715-2. ^ "INTERVIEW: Cengiz Şişman on the Dönmes' 350-year 'burden of silence' – BOOKS". ^ a b "Turkish Jewry's secret medieval messianics survive". Halperin, David Joel (2007). Sabbatai Zevi: Testimonies to a Fallen Messiah. Littman Library of Jewish Civilization. ISBN 978-1-904113-25-6. Gershom Scholem, Sabbatai Sevi: The Mystical Messiah: 1626–1676, Routledge Kegan Paul, London, 1973 ISBN 0-7100-7703-3, American Edition, Princeton University Press, Princeton, 1973 ISBN 0-691-09916-2 (hardcover edn.). --, "Shabbetai Zevi," in Encyclopaedia Judaica, Second Edition, Farmington Hills, Michigan, 2007, vol. 18, pp. 340–359. ISBN 978-0-02-865946-6. John Freely, The Lost Messiah: In Search of the Mystical Rabbi Sabbatai Sevi, The Overlook Press, Woodstock & New York, NY, 2001. ISBN 1-58567-318-8. Mark Mazower, Salonica, City of Ghosts: Christians, Muslims, and Jews, 1430–1950. New York: Alfred A. Knopf, 2005, pp. 69–71. Print. Matt Goldish, The Sabbatean Prophets, Cambridge: Harvard University Press, 2004. Moshe Idel, Messianic Mystics, New Haven: Harvard University Press, 1998 (Chapter Six: Sabbateanism and Mysticism, pp. 183–211. Marc David Baer, The Dönme: Jewish Converts, Muslim Revolutionaries, and Secular Turks, Stanford: Stanford University Press, 2010. Cengiz Sisman, The Burden of Silence: Sabbatai Sevi and the Evolution of the Ottoman-Turkish Donmes, New York: Oxford University Press, 2015. Cengiz Sisman, Transcending Diaspora: Studies on Sabbateanism and Donmes, Istanbul: Libra Publishing, 2016. Alexander van der Haven, From Lowly Metaphor to Divine Flesh: Sarah the Ashkenazi, Sabbatai Tsevi’s Messianic Queen and the Sabbatian Movement. Menasseh ben Israel Instituut Studies 7, Amsterdam: University of Amsterdam/Menasseh ben Israel Institute, 2012. ISBN 978-90-815860-5-4. Graetz, Heinrich, History of the Jews, The Jewish Publication Society of America, Philadelphia, 1895, vol. V, pp 51–85. Koutzakiotis, Georges (2014). Attendre la fin du monde au XVIIe siècle. Le messie juif et le grand drogman. Textes, Documents, Études sur le Monde Byzantin, Néohellénique et Balkanique 15. Paris: Éditions de l’Association Pierre Belon. Wikimedia Commons has media related to Shabbatai Tzvi.